To say that the weather this weekend was a little strange is like saying the Pope is a little Catholic. Friday’s warm temperatures would have been odd enough for this time of year but it also rained. It didn’t snow and it wasn’t even sleeting – it was pouring rain. Needless to say snowmobile conditions have deteriorated. That’s the bad news. The more positive news is that snowmobile cancellations have created openings for the end of this month. We now have 4 cabins open for next weekend (February 26th & 27th) so if you have been thinking of a late winter trip north for fishing or relaxing give us a call! Ice fishing has been good this winter and the milder temperatures have made it more comfortable to spend time outside! Lake conditions after Friday’s rain were slushy but cold weather early this week should firm up the lake surface allowing for 4-wheel drive truck access. 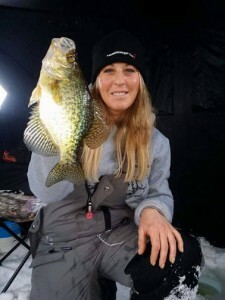 Fishermen over this past weekend still managed to catch a mixture of nice sunfish and crappie. We would love to talk to you about a late winter stay at Wildwood so check out our availability and then contact us. There is still a lot of Minnesota winter left to enjoy so get out in it!